It feels only natural that Microsoft continues updating core Windows modules and programs which they have started under Windows 7. It is safe to say that additional modules and features will be updated. 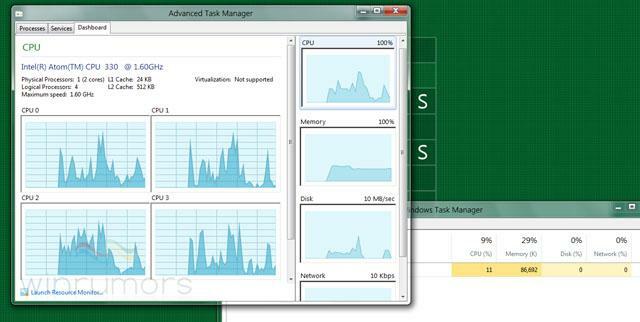 One of the latest that we know of is the Windows Task Manager which will get a complete overhaul. There are currently two images available of the improved Windows Task Manager which you find below. The first screen shows the dashboard of the Advanced Task Manager. It displays the cpu, memory, network and disk load in graphs. Tabs are available that lead to the process and service listing.